Argaum and DHS Old boys played a pre season friendly against a new look Plymouth Argaum on Wednesday evening at Bickleigh Down. Argaum started the fixture strongly with Fijians centre Semi Daica & standoff Villiam Morcia playing some attractive fast rugby. Plymouth Argaum continued the club re-build with a hard fought won over a strengthened Wizards side. The Wizards were after revenge from their last encounter were Argaum scored over 50 points and they fielded a much stronger team. Plymouth Argaum Wanderers started the club re-build with a convincing win over local rivals, DHSOB Wizards. 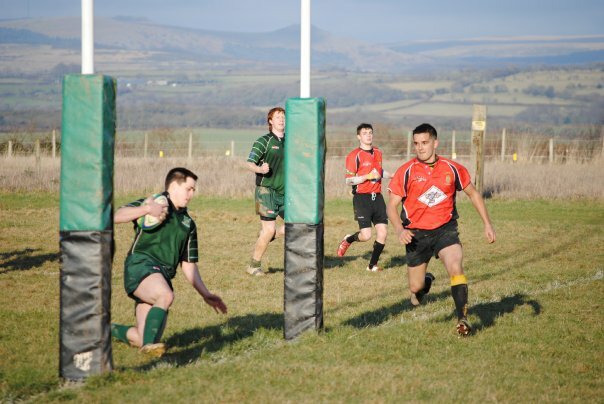 With two early tries from new scrum half Bret Williams and fly half Darren Wills, Argaum looked promising from the start. Mixed fortunes for the two Argaum sides playing at the weekend as The Chiefs went down 33-22 at home to DHSOB after leading 17-5 at half-time. Click here for the full Evening Herald Report . Match Action photos from Paul Mattock can be found here. The Colts impressive form continued with a hard fought 7-7 draw at home to Newton Abbot, the Argaum try came from Ryan Phillips with Jake Turfrey converting. The Wanderers kept up their 50% record with a second win of the season over DHSOB's second string. A game which earmarked club stalwart Andy Critchley's 40th birthday, saw appearances by Phil and Danny Morgan, along with Paul Critchley to spice things up in the backs. AFTER seeing off early Argaum pressure, the Old Boys ran out winners by 28 points. Argaum's Jim Twist, on the back of that pressure, eventually bisected the sticks to put his side ahead on the third penalty attempt. The Old Boys took the lead with a Jamie Burton try, which fly-half Alex Buckley converted. Argaum's defence held out on the heavy pitch to stop Devonport's ambitions, but centre Del Jenkins got on the end of a good move to score a second try and Buckley's conversion made it 14-3 at the turnaround. The Old Boys then took charge using the Roborough slope to their advantage and Jenkins headed home for his second touchdown and Buckley added the extras. Second-row Paul Walters did the work for Neil Harthill to dive in on the left wing before Devonport pushed a five-metre scrummage over the Argaum line and number eight Scott Williams got the touchdown. The Wizards romped to a 17-point half-time lead, but were hit by quick ball from their rivals after the break as Tigers fought back and claimed a deserved victory. A much improved performance from the Chiefs who were missing several key players through unavailability but in the end another league defeat. A bright, open game, played in the best spirit, between the co-tenants of the Roborough pitch, ended a draw, each side scoring penalty goal. Metters, the Argaum full-back, made the first score early on. Both packs showed up well with the home eight just a shade more constructive, but the Old Boys were fast spoilers. Dixon, at winging-forward, came near to increasing the lead, but defences remained on top. Ten minutes from the end Mahoney was caught in possession, and Bartlett made no mistake with his third penalty kick.